Tessa is one of four dogs which arrived on 8 September from Ireland. These dogs travelled for 20 hours before reaching our kennels, and even though they were probably exhausted from the journey, they still greeted the kennel staff with wagging tails and lots of licks ? which says everything about what wonderful dogs Greyhounds are. Tessa was born in 2009. 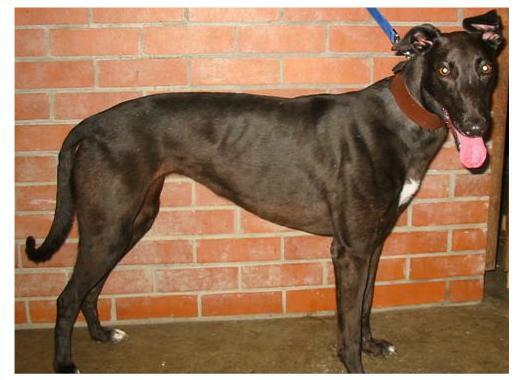 She is a very gentle little girl who wasn?t good enough on the track and was therefore unwanted, like so many others!! She is very sweet and loves human contact and just can?t wait to meet people. Tessa has now found a lovely home and has settled in very well, sleeping on her owners' bed at night and on the sofa in the daytime!